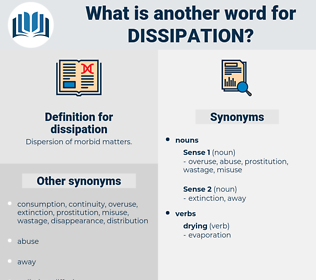 What is another word for dissipation? degradation, dispersive, wastefulness, sink, dissolution. 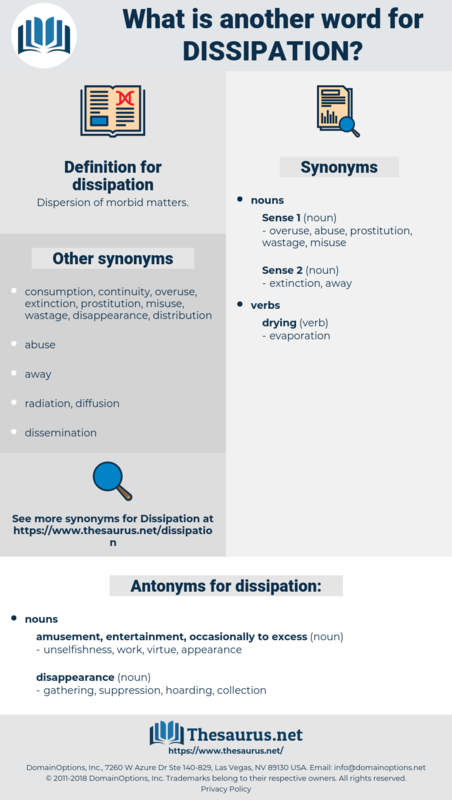 Dissipating, absorption, fragmentation, wastage, diffusion, Disbanding, scatter, waste. frugality, destitution, morality, dearth, defect, lack, shortcoming, inadequacy, scantiness, insufficiency, failure, economy, concentration, need, deficiency, assembly, want, poverty, goodness. But they have a certain novelty; they are picturesque and oftentimes attractive and entertaining to homesick soldiers, who, as is natural, yield easily to temptations to dissipation. The wedding and all the accompanying round of dissipation. disputation, decapitation, djiboutian, Disceptation, deception.